Woman made "Swedish-American Avant Rock-laden Lushcore Euro Dream Jazz" written for voice and harp, two saxophones, guitar, piano, bass and drums. Estrogenia is a feminist superheroine created by Jalkéus. 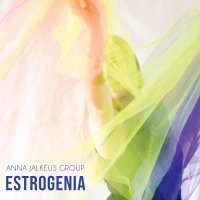 This is the title track from Anna Jalkéus Group's debut album Estrogenia, composed by singer-harpist Anna Jalkéus. In the words of Devon "Doc" Wendell, LA Jazz Scene "Anna Jalkeus has carved her way onto the jazz/fusion world with her distinct band and sound of her own. Her debut album Estrogenia is a journey inside the artist. It’s not linear or simple. It’s a thought-provoking work of art" (...) "Estrogenia is a compelling debut recording by a fascinating artist and equally compelling group. This is original jazz at its best."